From Clive’s victory at Plassey in 1757 to the outbreak of the Mutiny of 1857, Britain’s empire on the subcontinent was administered by the East India Company. A chartered monopoly, the Company significantly expanded its fiscal, territorial and military grip on the subcontinent in the century before its abolition in 1858. By the later 1750s, its servants (that is, its civil and military officers) enjoyed unprecedented access to Asian goods, through bribes, ceremonial gifting, private commerce and the spoils of war. Together with the Company’s official cargoes of Indian and Chinese commodities, these goods helped to transform British families’ material sensibilities and homes. Running between September 2011 and August 2014, The East India Company at Home, 1757-1857 project fulfilled five main objectives. First, it created a series of interlinked case studies (of people, objects and homes in England, Scotland and Wales), through which it explored how the acquisition, use, meaning and circulation of Asian luxury goods came to shape the British country house. Second, the research produced by the project situated the Asian goods that furnished Georgian and Victorian homes within ongoing social, cultural, political and economic relations, rather studying them in isolation from their dynamic historical contexts. Third, the research team and project associates illuminated the ways in which material culture helped to mediate wider historical processes, such as family formation and reproduction, the creation and maintenance of trade networks, and the operation of political and military systems. Fourth, together the case studies assessed the ways in which Asian luxuries incorporated within British country houses expressed (or, at times, papered over) regional, national and global identities. Fifth, The East India Company at Home integrated academic and museum-based research on the global genealogies of British country house interiors with research findings generated by amateur local and family historians through a series of events and by co-producing over 30 case studies that were made available on the project website. During the project archival research on the selected families and homes was supplemented by analysis of material objects, contemporary printed descriptions and debates on the meaning of Asian commodities conducted in the periodical and newspaper press. Information on selected families and country houses was expanded—and connected to wider networks of persons, things and places—by the project’s engagement with ongoing research conducted by both curators and other specialists in material culture and family historians and local history societies. This engagement across the full range of the historical community both enriched the research available to the academic team and — through the project’s website — helped to bring genealogical research undertaken by family historians into a wider public domain. The website provides accessible synopses of the project’s case studies (several of which will also be disseminated to academic audiences through scholarly publications). Designed to provide both academic and non-academic audiences with bibliographical tools for the study of Anglo-Indian culture at home in Georgian and early Victorian Britain, the website also provides access to a searchable online bank of information on the persons, objects and country houses that mediated the incorporation of Asian material culture into eighteenth- and nineteenth-century elite British homes. The East India Company at Home research team comprised four core members (Margot Finn, Helen Clifford, Kate Smith and Ellen Filor) and was supported by an advisory board (Viccy Coltman, Sue Stronge, Margaret Makepease, Keith Sweetmore, Lowri Ann Rees and Marion Moverley). During the course of the project the team was also joined (on a short-term basis) by website developer Paul May and two AHRC Cultural Engagement Fellows, Yuthika Sharma and Chris Jeppesen. 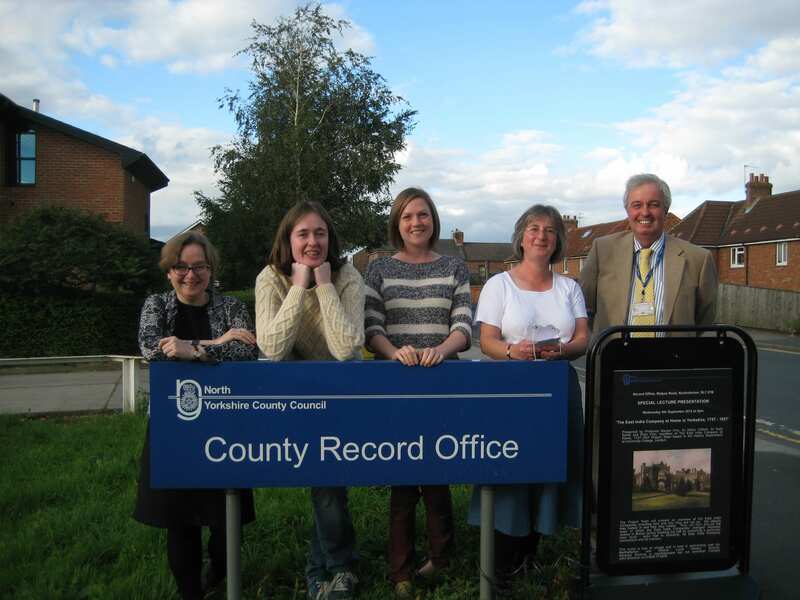 (From left to right) Margot Finn, Ellen Filor, Kate Smith, Helen Clifford and Keith Sweetmore outside the North Yorkshire County Record Office in September 2012.